﻿Juneteenth: Calendar, History, Tweets, Facts, Quotes & Activities. Juneteenth, also called Freedom Day and Emancipation Day, celebrates the abolition of slavery in the United States. On June 19, 1865, Union soldiers arrived in Texas to deliver news that President Lincoln has issued the Emancipation Proclamation, freeing the enslaved. Although Lincoln's Proclamation was issued on January 1, 1863, it took nearly two and half years for word to travel from Washington to Texas. By then, Texas had amassed more than 250,000 slaves. Since 1865, Juneteenth has been informally celebrated throughout the country however in 1980, Texas became the first state to recognize it as an official holiday. Shortly thereafter, other states also proclaimed the holiday. Today, Juneteenth is a celebration of African-American freedom, heritage and culture observed through songs, communal cookouts and parades. The national juneteenth theme is Together we will see Juneteenth become a national day of observance in America!. According to the International Labor Organization, almost 21 million people are victims of forced labor today, 11+ million women and girls and 9+ million men and boys. Juneteenth is an official state holiday in Texas, meaning that Texans do not work. 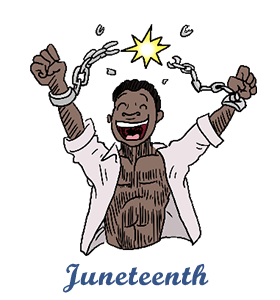 Juneteenth is a combination of the words June and Nineteenth in reference to the date that slaves were freed in Texas. The people of Texas are informed that, in accordance with a proclamation from the Executive of the United States, all slaves are free. This involves an absolute equality of personal rights and rights of property between former masters and slaves, and the connection heretofore existing between them becomes that between employer and hired labor. The freedmen are advised to remain quietly at their present homes and work for wages. They are informed that they will not be allowed to collect at military posts and that they will not be supported in idleness either there or elsewhere. - General Gordon Granger, Major General of the United States Army, Issued June 19, 1865. Visit the Whitney Plantation, America's first slavery museum, to learn about impact of slavery in Southern America. The museum contains exhibits, artwork, restored buildings and first-person slave narratives about the lives of those enslaved in Louisiana. Sing traditional Juneteenth songs. These include Swing low , Swing Chariot , and Lift Every Voice and Sing . Attend the annual Juneteenth Emancipation Celebration at Emancipation Park, Houston Texas.